Arrow Scientific emphasises the importance of hand washing in any industry, food safety, OH&S and is crucial to any HACCP plan. Up to 40% of the foodborne illness outbreaks are from the results of poor hand washing and cross contamination. The GlitterBug Potion, developed by Arrow Scientific, is a health cleaning product that helps to ensure staffs are using effective hand washing techniques. The GlitterBug Potion is a metered pump back, which only requires a UV Lamp. To help determine thorough hand washing techniques, a staff member would dispense the GlitterBug Potion onto their hands and rub it like using hand cream. 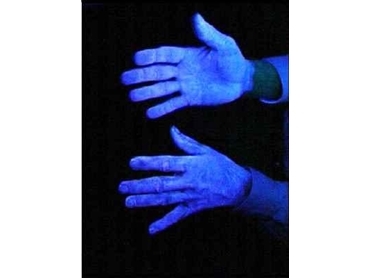 Under the UV Light, the GlitterBug Potion will make the hands shine to help highlight the potential causes of contamination and threats to food safety. fter washing hands, staff can then use the UV Lights to check their hand washing techniques have been effective. If the hand washing is ineffective, the GlitterBug Potion would highlight missed and unwashed areas by allowing it to shine under the UV Light. These glowing areas are commonly found around fingernails and in the cracks or around the back of the hands. The GlitterBug Potion, available from Arrow Scientific, will help staff instantly know when their hands are not thoroughly washed, as well as provide better prevention to potential cross contaminations in food safety. The GlitterBug Potion can also be used with waterless antimicrobial hand washing gels.